Eighteenth-century images of Native Americans are rare, but portraits from this period that praise individual chiefs are even more unusual. This striking 1755 print, entitled The Brave Old Hendrick the Great Sachem or Chief of the Mohawk Indians, features Hendrick Peters Theyanoguin. He was a powerful Mohawk leader within the Iroquois Confederacy (also known as the Six Nations). 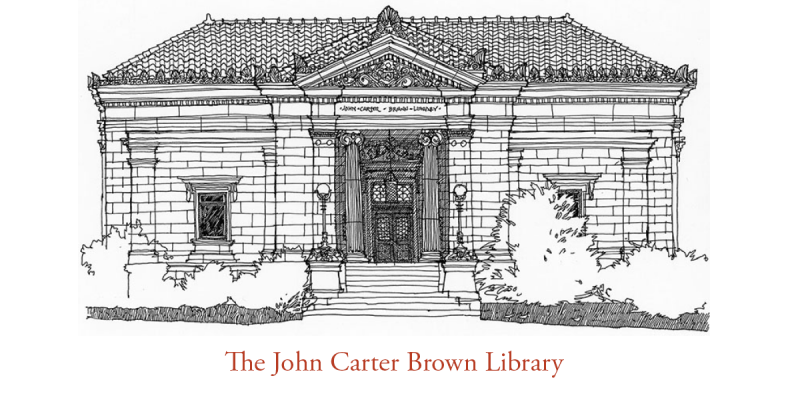 The John Carter Brown Library is one of the few institutions with a copy of this hand-colored engraving. 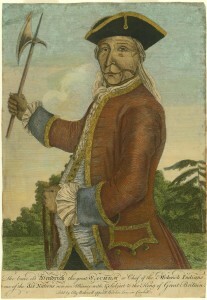 The portrait glorifies Theyanoguin for his alliance with the British and for fighting on their side during the French and Indian War (1754-1763). Born around 1691, Theyanoguin became the first colonel of the Iroquois Confederacy and the first commissioner for Native American affairs in the northern colonies. His leadership and alliance with the British helped the Mohawks maintain their political, economic, and military strength in North America even as the British Empire grew. Unlike contemporaneous imagery that depicted Native Americans as uncivilized peoples, this portrait presents Theyanoguin in a positive light. The John Carter Brown Library’s portrait was one of three versions of Theyanoguin’s portrait printed in London after his death during the Battle of Lake George in 1755. The portrait recognized the sacrifice of a man who died for the British cause. Theyanoguin’s portrait depicts a man fluent in British and Native American cultures. He wears a British-style jacket with gold trim, a white ruffled shirt, and a tri-cornered hat. The Mohawk leader even has a protruding stomach, an attribute associated with wealthy European gentlemen who could afford to eat well. On the other hand, Theyanoguin also holds a wampum belt and a tomahawk, items associated with Native Americans. His face features tattoos—including a sunburst on his left temple—which was a popular practice for Native Americans in the Iroquois Confederacy. The accuracy of Theyanoguin’s portrait is unknown. He never went to London, so the engraver probably had never seen him. The engraver, however, might have seen his portrait. Theyanoguin could have sat for a painter in the colonies who sent the portrait to London. If so, the portrait no longer exists. A third possibility is that the engraver imagined what Theyanoguin looked like in order to satisfy demand for a portrait of the recently fallen famous man. Theyanoguin was so important to the British that he became the subject of this portrait and a person of note on this map. Consumers in the colonies and England could purchase items commemorating the prominent leader. These pieces recognized Theyanoguin’s leadership and the Mohawks’ alliance with the British during the war. You can see the John Carter Brown Library’s copy of this portrait of Theyanoguin on display in the Norman B. Leventhal Map Center’s exhibition at the Boston Public Library. The exhibition, We Are One: Mapping America’s Road from Revolution to Independence, uses maps to explore the tumultuous events that led thirteen colonies to forge a new nation. We Are One demonstrates that maps, from the map of the Battle of Lake George to early maps of the new nation, were central to the revolutionary process. The exhibition features maps as well as prints, paintings, and objects from the Leventhal Map Center’s own collection and those of twenty partners, including the British Library and Library of Congress. Visit zoominginonhistory.com to explore georeferenced maps from the exhibition. The Leventhal Map Center also hosts the NEH-funded American Revolution Portal database. Researchers can access maps from the American Antiquarian Society, British Library, Library of Congress, and other institutions in one search. Users can download images for research and classroom use. Access these resources and learn more about We Are One at http://maps.bpl.org/WeAreOne.